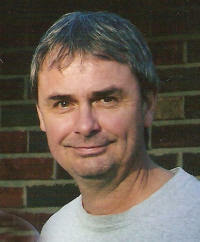 Ronald D. “Fonz” Fischer, 51, of Breese, died Friday January 8, 2010 at his residence. He was born December 28, 1958 in Breese to Henry “Harry” and Elvira “Vera” (Kreke) Fischer; they preceded him in death. Also preceded in death by a brother, Gerald “Jerry” Fischer. He married Gwen Lakenburges on October 23, 1982 at St. Boniface Church in Germantown and she survives in Breese. Also surviving is a son, Nick Fischer of Breese; brothers, Dennis (Mitzi) Fischer and Bill (Beth) Fischer all of Breese; a sister, Maribeth (Calvin) Rogers of Breese; father-in-law and mother-in-law, Roger and Florence (Boeckmann) Lakenburges of Germantown; sisters-in-law and brothers-in-law, Carol Fischer of Breese, Lisa (Bill) Rathmann of Germantown, Denis (Dawn) Lakenburges of Germantown, Dawn (Bob) Groetecke of Columbia, Lois (Erick) Guzman of Chesterfield, MO; and numerous nieces and nephews. Ron was currently employed with SCT as a bus driver and previously with R&B Plumbing in Breese for 31 years. Member of St. Augustine Catholic Church in Breese. Funeral Mass of Christian Burial will be Tuesday, January 12, 2010 at 10:00 am at St. Augustine Catholic Church in Breese with Fr. Chuck Tuttle and Deacon Bob Lippert officiating. Interment St. Dominic-St. Augustine Cemetery. Visitation will be held on Monday, January 11, from 4:00 to 8:00 pm and Tuesday, January 12, from 8:00 to 9:45 am at the Moss Funeral home in Breese.